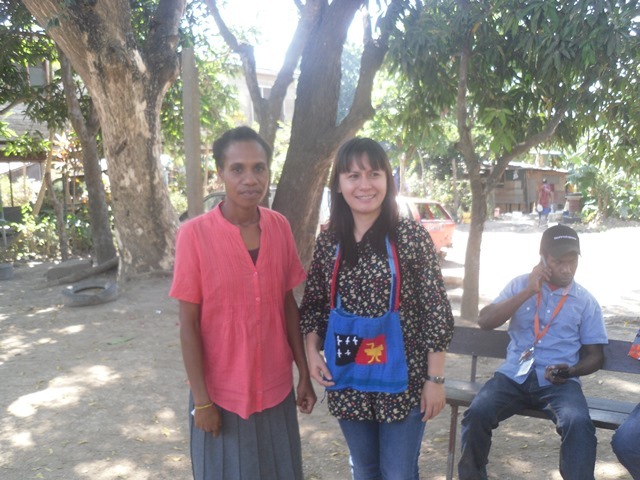 Port Moresby – Faole SDA Adult Literacy School – Erima receives timely assistance from ADRA PNG through Anglicare PNG Inc. This was the message given by a special guest at the Faole SDA Adult Literacy School presentation at Erima in the Nation’s Capital recently. Ms. Jasmine Simyunn Country Director, for the Adventist Development and Relief Agency (PNG ADRA) said during her speech that nothing in life was easy but there are always solutions to every problem. “Put God first and you as the individual will make the changes in life to make a change and solve your problems, the spirit in you makes you overcome your challenges” she said. The presentation was an initiative of ADRA PNG through Anglicare PNG Inc. as it had created a partnership with the Faole SDA Church to start an Adult Literacy Centre to cater for the Church members and also the surrounding community of Erima. Mr. Gideon Mii Chairman of the Faole SDA Adult Literacy School was full of praise for the assistance given by ADRA PNG as it would ease the load of students per class. He said that adult learners currently numbered 33 who are taking classes within the church building. Mr. Mii added that with the donation of canvasses and white boards, they can now have classes outdoors. He said he wanted the community through the church to take ownership of the Adult Literacy School so that there would be progress in years to come, and one being the suggestion to open another Adult Literacy School for the community of Erima as a whole. A female leaner thanked Anglicare and ADRA for the timely donation but also raised the question to what their future was when they completed their final level 3. “Sapos mipla finis lo levol 3 bai mipla go wer?” She added that they wanted to continue their education but did not know the procedures involved. Branch Manager for Anglicare Port Moresby, Mr. Bernard Paru gave an assurance that the Faole Literacy School learners were more than welcome to enter the Anglicare Adult School and Anglicare would help in finding a placing in FODE for those who did well and wished to further their education in Technical and Vocational Training Institutions (TVET). Ms. Gloria Numa a Program Coordinator for ADRA was pleased at the progress of the Adult Literacy School and also gave her insight to the importance of learning and seeking further education. This is very inspiring and good for all who did not have the chance to finish their education when they were small due to whatever reasons they had. Anyways, can you also help adults who know nothing about reading and writing English or Tok-Pisin just like the small children? Is anyone welcomed to your school? Do we have to pay any fee? How long do you have to teach them? Hi Mary, Thank you for your message. At Anglicare we do provide Literacy for level 0 – Level 4 . That means if you are adult and want to know about about learning to read and write (But you know nothing) then Anglicare Literacy is your choice. Each level takes 20 weeks to complete. You pay a registration fee of K 20.00. Hope I have answered your questions. Thank you very much, you have answered my question. How many years will it take to finish all the levels? Level 0 – 4 ( It will take approximately 2 years).. It depends on how fast you learn, if you can learn quickly, the changes are that you may skip level as well. Thank you very much again, I’ll get back to you again if I have another question or concern. Hi, I have one more question to ask, if they finish all there levels, what will they do? Sorry spelling error for there it should be their levels. The courses are designed in such a way that from Level 4 literacy they can move into Skills training. Having considered that most of the student do not want to continue on schooling but want top be trained in a specific areas to find work immediately, Anglicare PNG understands that. I have a question with regards to the Anglicare Adult Literacy Training Center located at North Waigani. Will you be enrolling any interested students there for 2017? If so, when does enrollment/registration start. Also, is there a contact number or email you can provide me with. The numbers given in the telephone directory have not been working for some time now and I’m very much interested in speaking to someone with regards to my queries. We have closed enrollment for this year but you can come at visit the office to get more information. When is the registration for the adult literacy? Good morning. I am inspired to reading the article about Mary’s questions and replies to her questions.